While I haven’t been around in the microscopy and microanalysis world in a professional sense for too long, it’s hard not to notice how often the faces stay the same but the title on the name tag or the company logo changes. Just to name a few from the EDAX side, Patrick Camus (Director of Engineering) used to work in applications for Noran, John Haritos (Southwest Region Sales Manager) came from Oxford, Sophie Yan (Applications) came from Zeiss, and Dave Durham (Western Region Sales Manager) came from Bruker. 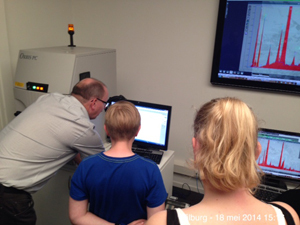 Though microanalysis is a big field, it’s a small world once you get into the commercial side of it. I guess it shows that there are not too many of us that really have the deep level of interest and dedication to stay in field and the ones that do are often in short supply. While some of the changes could be a case of the grass being greener on the other side, it often seems to be driven by the desire for a career step or for personal reasons. The interesting part is that I have very rarely seen anyone hold a grudge or perceive a move to another company in the field as something negative. Every year it seems like a couple of the old faces retire (though they often still show up at M&M, often wearing their last company shirt), but you start to recognize the rest of them despite any changes in affiliation. This makes it a little easier to identify the new faces and with that, I would like to introduce the newest one at EDAX: Shangshang Mu (pronounced Shong-shong) recently joined us as an applications engineer and will be based in our Draper, Utah office. He holds a PhD in Earth Sciences from Boston University and was most recently lab manager at Southeastern North Carolina Regional Microanalytical and Imaging Consortium. At EDAX, we are excited to have him on board and look forward to the rest of you getting to know him. There’s A Hole in Your Analysis! Dr. René de Kloe, Applications Specialist EDAX. 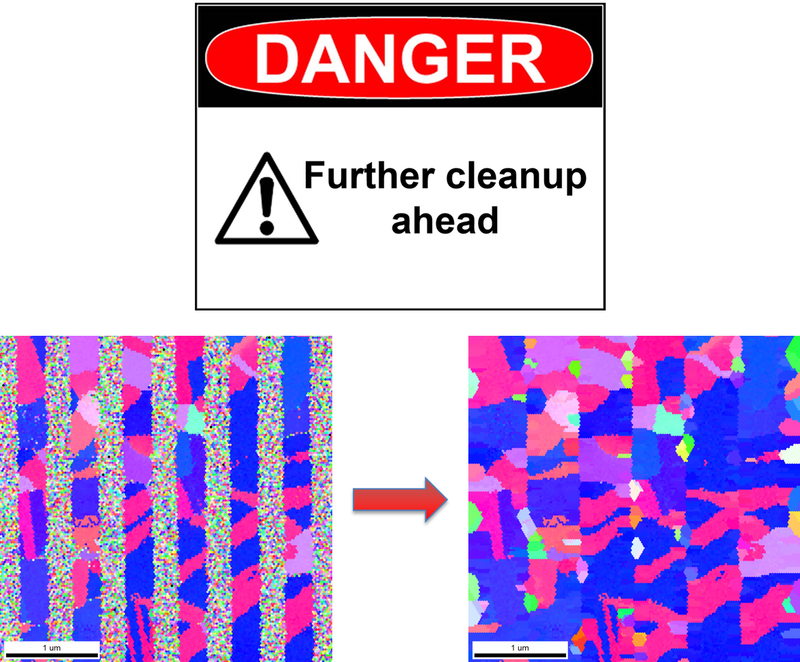 EBSD analysis is all about characterizing the crystalline microstructure of materials. 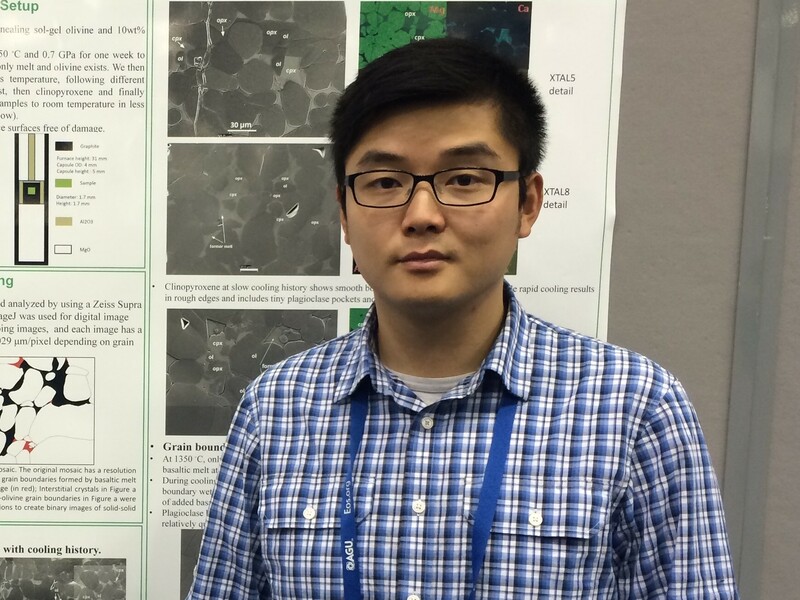 When we are analyzing materials using EBSD the goal is to perform a comprehensive analysis on the entire field of interest. We strive to obtain the highest possible indexing rates and when we happen to misindex points we feel compelled to replace or clean these with other “valid” measurements that we simply copy from neighbor points so we do not have to show these failures in a report or paper. But what should we do when we don’t expect data from specific spots in the first place? For example if a sample is porous or contains non-crystalline patches, or perhaps we have phases that don’t produce patterns? Then we typically simply try to ignore that. We may perhaps state that a certain fraction of our scan field refuses to produce indexing results and show which pixels these are, but that’s about it. Figure 1: Pearlitic cast iron with graphite nodules – 13.5% graphite. And that is strange as such areas where we don’t expect patterns are truly an integral part of a material and as such should also be characterized for a complete microstructural description. 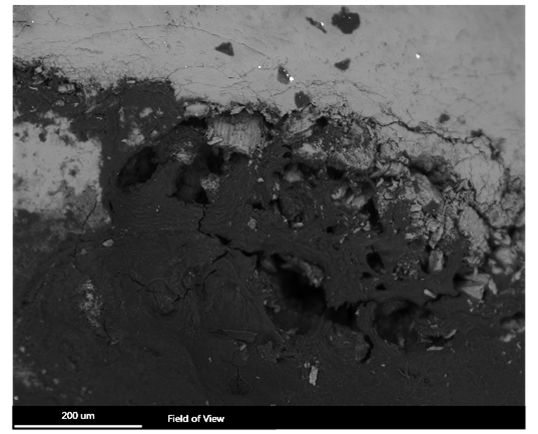 A traditional example of such a material is a cast iron which, although not porous, contains graphite inclusions which typically do not produce indexable EBSD patterns (Figure 1). Another example is the characterization of material produced by 3D printing of different metals, where small metal particles are sintered together using localized laser heating. This process doesn’t generate a fully dense product (Figure 2) and understanding the pore structure is important in predicting its mechanical response to stressed conditions. Analyzing the non-indexed areas creates some challenges for the data treatment, especially any cleanup that you may want to do. You need to be careful to ensure that individual misindexed points, for example along grain boundaries or inside grains are not considered as pores. For a full analysis we need to be able to treat pore spaces as a special type of grain. Not one where pixels are grouped together based on similarity in measured orientation, but just the opposite, where pixels are combined based on misfit. This poses a special challenge on cleaning your data. When a typical clean-up acts like an in-situ grain growth experiment, where grains are expanded to consume bad points, in porous materials data cleanup needs to be done carefully to prevent the real grains from growing into real non-indexed spaces. For steps 1 and 2 we can use the patented Confidence Index in the OIM™ Analysis software. For step 1 we setup a filter to allow only correctly indexed points (typically with CI>0.1). However, this may remove too many points along grain boundaries, for example, where patterns overlap and indexing is uncertain. In step 2 we apply a confidence index standardization to retrieve all pixels that were indexed correctly, but had a low CI value and were excluded in step 1. This step assumes that if the orientation of a pixel matches that of adjacent pixels that had a high CI value, it was correctly indexed and needs to be included. This step does not change any measured orientations. Figure 3: Effect of too rigorous cleanup of partially crystalline material – Cu interconnects. A cleanup method that verifies whether a minimum number of neighboring points belong to a single grain such as the neighbor orientation correlation, is preferred. Now that we know where the holes in the material are, we can get serious about analyzing them. First we need to define our real grains. 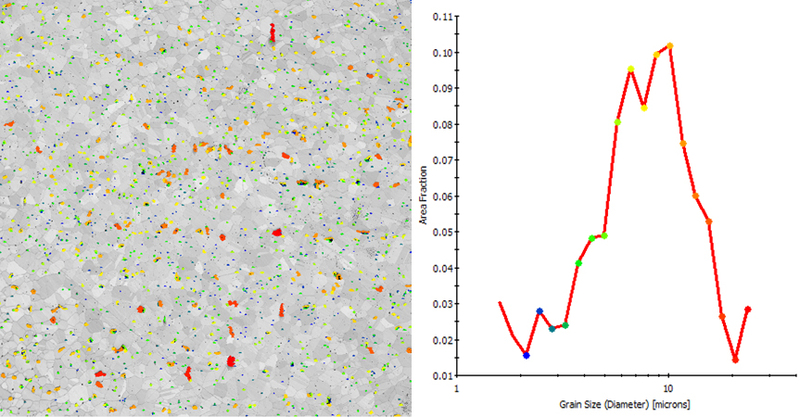 Grains in EBSD analysis are defined by groups of points with similar orientations and a minimum number of pixels, for example maximum point to point misorientation less than 5 degrees and minimal 3 pixels in size. When you remove these grains from your partition, the left over pixels that do not fit into the grains can now be recognized. Coherent clusters of these misfit pixels are then grouped together into what might be called antigrains (Figure 4). Figure 4: Grain and antigrain definition. But even when the pores are recognized this way, the antigrains are not characterized by their orientation and as such their boundaries will do not show up in a traditional misorientation boundary overlay, which only shows the misorientation between recognized grains (Figure 5a). In order to make the antigrains visible as well, a boundary type that does not use misorientation as a criterion, but rather the position of triple junctions, needs to be selected. Between the triple junction nodes, vectors that follow all grain and antigrain interfaces are then constructed (Figure 5b). Figure 5a) Standard grain boundary overlay on IQ map based on grain orientation recognition. Non-indexed areas are white. 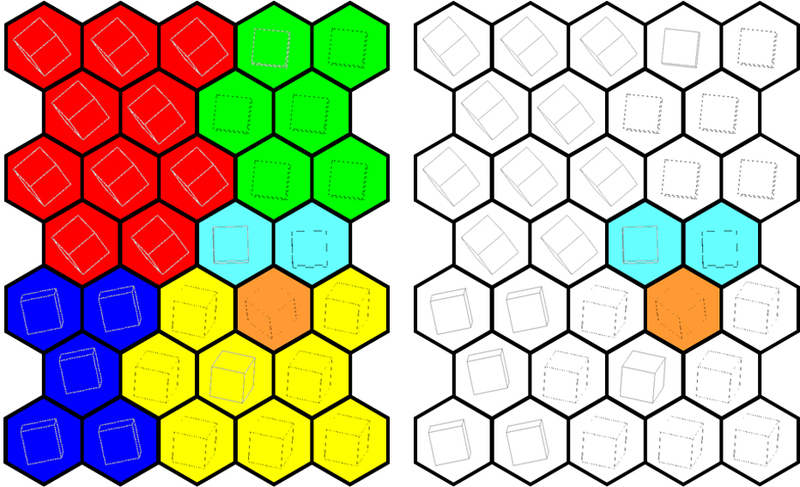 b) IQ map with reconstructed boundaries including the antigrain edges. Once the antigrains are fully defined, all normal grain characterization tools are also available to describe the pore properties ranging from a basic size distribution (Figure 6) to a full analysis of the pore elongation and alignment (Figure 7). 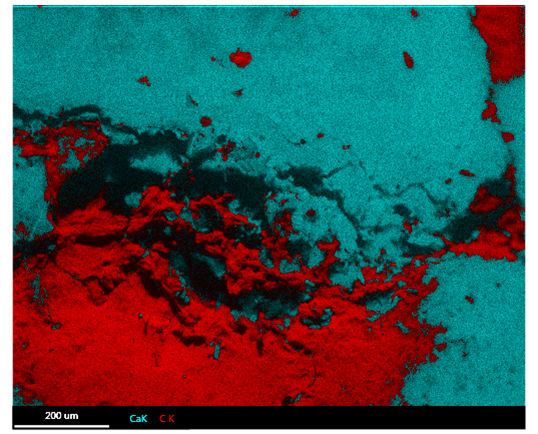 Figure 6: Pore size distribution with colored highlighting in 3D printed iron sample. Figure 7: Alignment of pore elongation direction. With non-indexed points now properly assigned into antigrains, a full microstructural description of not fully dense materials or materials containing areas that cannot be indexed, is possible. Finally we can do a (w)hole EBSD analysis. How difficult is it to explain to your friends and relatives what you are doing during the week? Microscopes, detectors and analysis materials are not things that usually ring a bell with your family, friends and neighbors. “It is all scientific and we do not understand any of it”, is the usual response to our descriptions of what we do. We at EDAX spend most of our time on our job and on the road. For most of us, this can only happen when our families support us by letting us travel the globe. 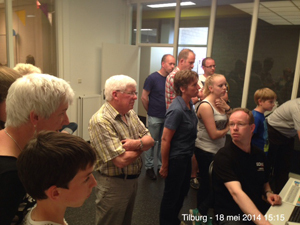 In an attempt to overcome this gap in understanding our “world”, I thought it would be worthwhile to organize an event where everybody at EDAX in The Netherlands could invite their family and friends to our lab and show them what we do in our world. Initially, I didn’t anticipate that there would be a lot of interest in this event, but I soon found out that close to 40 people were interested in coming. 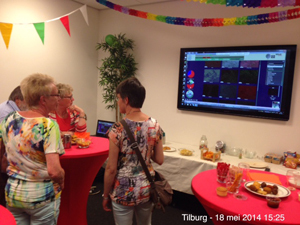 The event took place on Sunday May 18th at the EDAX facility in Tilburg, The Netherlands, where we usually have 6 employees working. In the afternoon people were flabbergasted by René’s and Harry’s impressive demonstrations. In no time family heirloom jewelry moved into the chamber in order to determine if the pearls were real or not (they were!). Someone else had a silver spoon, which had turned partly yellow after several times in a dish washer. What had happened to his spoon? Within 10 minutes René explained that the oxygen traces indicated corrosion, which had pushed the silver plating off to display the brass material underneath. Harry had a challenge to determine what an onion consists of. It turned out to be quite healthy thanks to several trace elements of metal. At the end of the afternoon everybody went home satisfied with what they had learned and they had concluded that the world of EDAX is indeed very different and also very interesting. Now when we leave for work in the morning, we see in the faces of our family that think that we are going out to do a “good job” for our world and this is nice to know. The tooth, the whole tooth and nothing but the tooth…. Tooth enamel is the hardest material in the human body. While it is easy to think biological materials are not a very interesting target for x-ray microanalysis, there are often unknowns lurking in the small and difficult to reach places. This is the case with a cavity just forming in a tooth. When my 10 year old daughter lost her tooth last year, I was intrigued by the ‘small’ brown spot that I noticed at the base of the crown of the tooth. Since small is a relative term in the world of microscopy and microanalysis and there’s always a hunt for new and interesting samples, I traded with the tooth fairy and gained a new sample. Despite the irregular shape of this premolar, I was easily able to mount it on a holder with carbon tape and I then brought it into the SEM under low vac mode to help conduct away the electron beam charge from the insulating material. Working at low vac is important for biological materials since introducing carbon coating for charge reduction creates confusion in native carbon distribution, and heavier metal coatings absorb the more delicate low energy x-rays which must escape the tissue. I was quickly able to see morphological differences in the suspected cavity area, with fine cracks and a sunken in appearance that wasn’t visible to the eye. 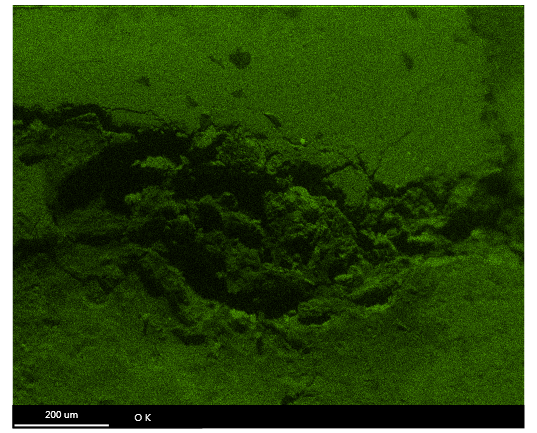 I then used one of the primary tools in a microanalyst’s toolkit, BSE imaging, to see atomic number contrast in the image, indicating gross changes in the chemical makeup around the sunken area. Within seconds of collecting the image, I gathered a spectrum from an area of less than one millimeter across. 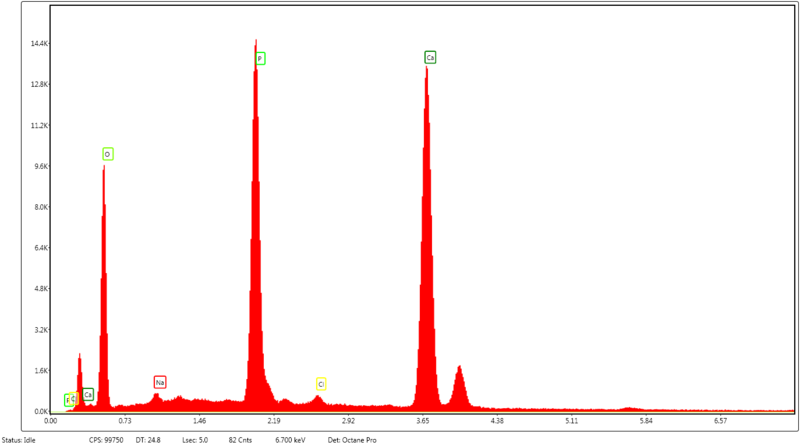 At moderate beam current, which the sample handled easily, the overall chemistry was immediately apparent with the clearly recognizable O, P and Ca peaks, even before the EXpert ID kicked in five seconds later. As anticipated, this is consistent with this being hydroxyapatite (HA), which is the main mineral component of tooth enamel and bones. The main reason for the formation of dental cavities is the erosion of the enamel by acid from eating sugars; erosion then permits bacterial invasion within this area. 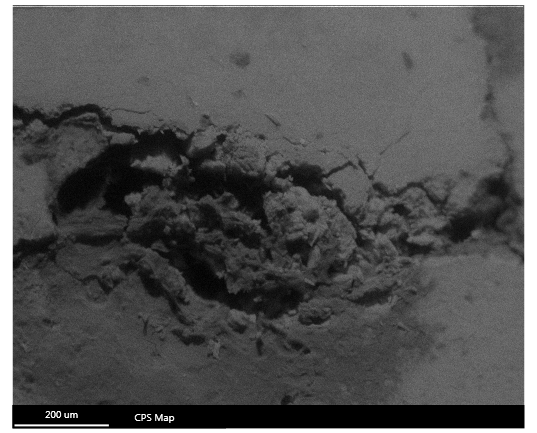 After the first spectrum collection, it was just a matter of tracking the chemical distribution around the cracks and with a few survey spectra, the carbon content was found to be highest in the darker areas of the BSE image. 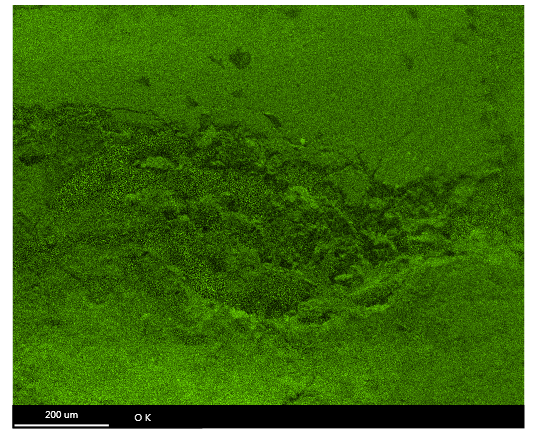 The presence of carbon indicates organic matter in the form of a bacterial biofilm within the eroded area. Since visual distribution is the surest way to understand the material, the next step was to collect an x-ray map. During the collection I selected the major constituents and dynamically overlaid them to understand how the chemistry matched up with the morphology, Ca and C shown here. The cracks and holes are confirmed with the unique CPS map, which shows variations of x-ray intensities and lends a better understanding of not only elemental intensities, but also the impact of topography on the appearance of those elements. Along with this function there is a normalization routine, which is applied to make up for the reduction of counts in the cracks and holes particularly for elements that are truly present throughout, such as can be seen with the Oxygen map before and after maps here. A final note here is that, interestingly, it is not directly the amount of sugar at one time that leads to the enamel loss but extended exposure throughout the course of the day. Better to eat one’s Easter basket in one sitting than making it last throughout the day to avoid cavities!